Barbara Muir Paints: Finished ...or is it? fit in my client's car, so we dropped it off before supper. when the little girl was two and eating her first candy. how it looks without a light on -- now. Labels: Delivery. Yay. gone to a new home. Barbara, this is lovely!! Congratulations! I immediately noticed the leaves in the background, thinking what a good idea that was! I find, the picture has suddenly gained more depth and the green is a perfect compliment to the other colours. Super! I can see why mother and daughter are happy with the painting. Thanks so much. It's true the painting gained depth with the illusion of trees. I'm so glad you like it. That means the world to me. Barbara, this portrait is so beautiful. Congratulations on another fine painting. Is it hard for you to part with when it is so lovely? Your clients are lucky to have this canvas to capture that moment in time. wonderful people. There's something very jolly about painting a portrait from life. I love it. 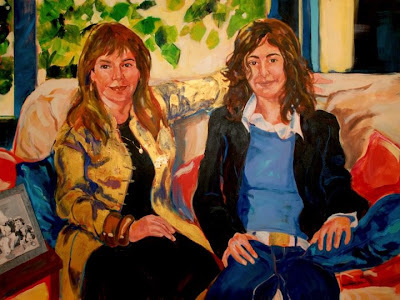 Barbara, I especially like this portrait of mother and daughter.It reflects the trust and the complicity that exists between them.Beautiful job! WOW! This is stunning...love that touch of gold leaf in Mom's jacket. What a stroke of genius. You have such great instincts. The leaves bring it all together and give it a finished look. I know the owners are ecstatically happy with it. What a beauty! Thanks so much. That is exactly what I was trying to do, and it's true they get along very well. The mother wanted to acknowledge that her daughter is growing up, and will leave home to make her own life, but with the painting she'll always have a touchstone of their love for one another. You are sweet. I'm glad you like it. I am actually quite proud of it, which is something you know feels wonderful, because we're usually so apologetic. 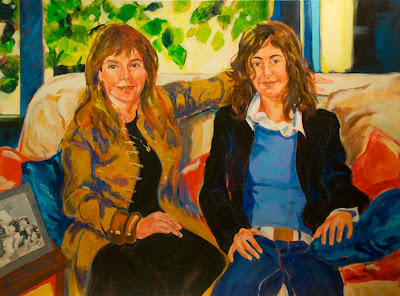 The nice thing about in studio paintings, is that you get time with the sitters to really get a strong feeling for them, and that adds to the meaning that jumps out of the brush. Congratulations, Barbara! Beautifully done. Really fabulous. What a treasure for this family. You have given them a great gift! This painting could never, ever, bore the viewer!! It's luscious, too. I must admit I was very happy that this worked out, and is a pleasure to look at. It's a big painting 3' x 4' and we put it on the wall in my studio to look at it. The women loved it, and I was delighted. Thanks so much. It's touching when people ask to include things that have great meaning to them. The woman's necklace is a replica in gold of the dog tags of a favorite dog. So the painting is thick with meaning -- and that is just wonderful.